As you probably know, the theme of the current Crafty Boots Challenge is 'Diamonds', because they are the birthstone for April. When I created the card I posted on 1 April, I actually made a second card, just in case my design went horrendously wrong. Luckily it didn't but I was then left with the dilemma of which to use for my Design Team project. This is the other card I made. This image is called The Get Away and is from the Gorguss Girls range of stamps, which I bought from the Crafty Boots on-line shop. After colouring it with Promarkers and Wink of Stella pens I distressed it, just a little, with Vintage Photo ink. I made a concertina shaped card. I then embossed some of my Crafty Boots Delux Crafters Paper with an Embossalicious folder and used some flat backed gems, glitter card and gold mirri from my stash to decorate the card. Finally I added a bow and three hat pins. 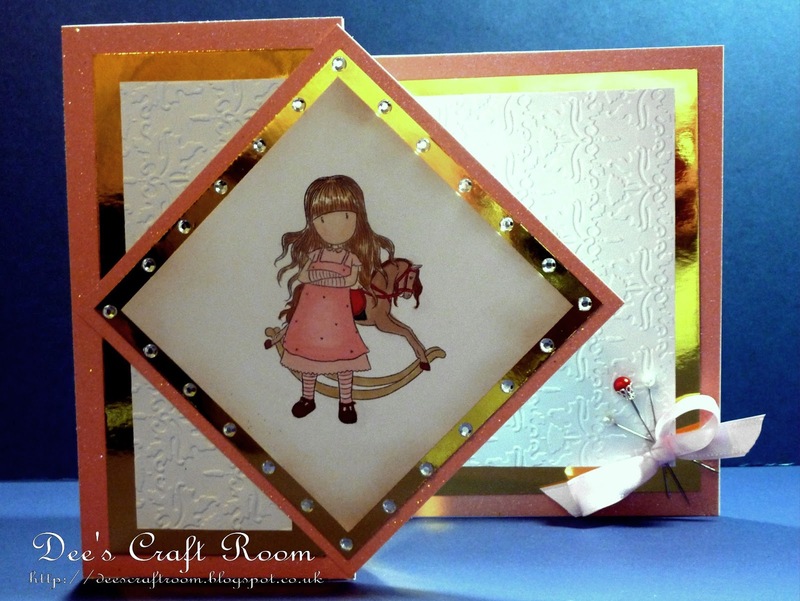 Don't forget to enter your 'Diamond' themed project into the Crafty Boots Challene. Love this shape of the card again! The embossing is so beautiful and so is the image. Love the sparkle with the gems and mirri too. 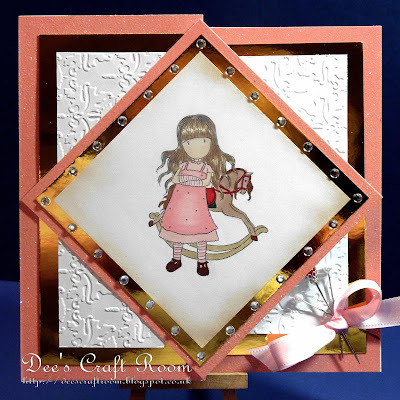 Another beauty and I love the colour palette -especially that cardstock. I have just invested in a couple of Gorjuss girls stamps but I hadn't seen this one with the rocking horse.